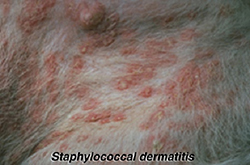 Staph is a kind of bacteria that is commonly found on skin. 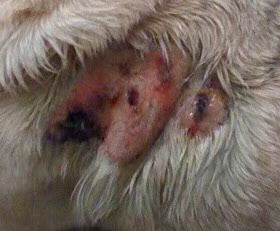 Some dogs will break out in pimples and infected hair follicles if their immune systems are stressed. The lesions can look like hives because they make the hair stick up on the bumps. 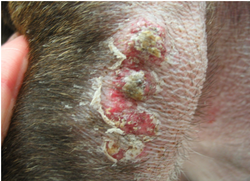 On non-haired areas, the lesions can look like ringworm – a circular patch with a crusty leading edge and sometimes a dark center. Your vet will usually prescribe oral antibiotics and medicated shampoo.